Do you have a picture of that? I don’t know how I’d mount it as I would probably just dangle it in the basket if I went that route. Edit: Robert, do you have a drip tray on yours? Because I’m lost on how to put that on without drilling into the outside of the freezer. My current scews are 1/4 inch. But they are in the door of my fridge. Not Robert, but I use a stainless steel drywall mud pan as my drip try. I found some outdoor rated, double stick, Velcro to stick it to the front of my freezer. It isn't perfect but it has worked for 10-12 years. I keep thinking I need to do something different but it works so other things take priority. I do have a drip tray. I attached a narrow board to the collar under my tap area, extending down a foot or so, and put the screws into that to hang the drip tray. 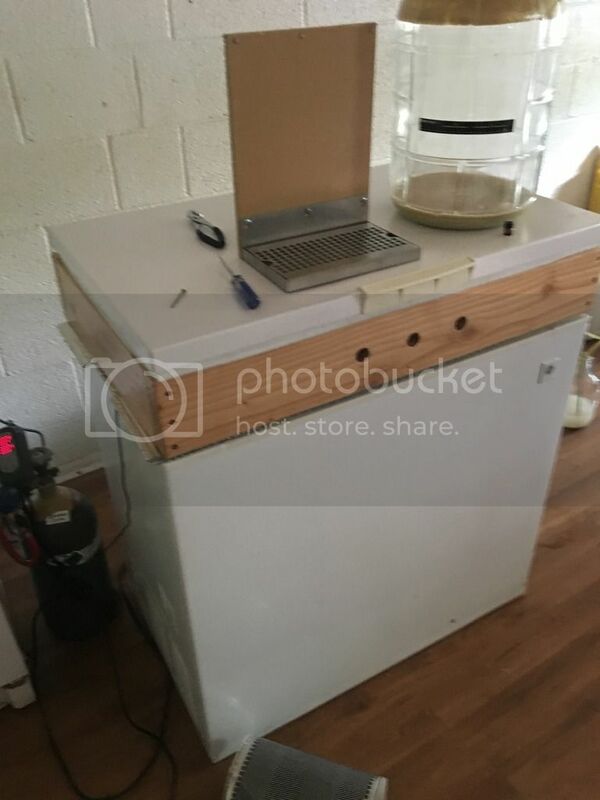 You could probably also attach a piece of wood just big enough to do the job directly to the freezer using construction adhesive or epoxy. (That might be the tidier approach.) Anyway you don't want to glue the drip tray directly, you have to remove it to clean it. Need a piece of wood and screws somehow. My basket is just a wire basket. Probably going to go the Robert route since it seems easier to just screw it onto the collar. Thank you for sharing. 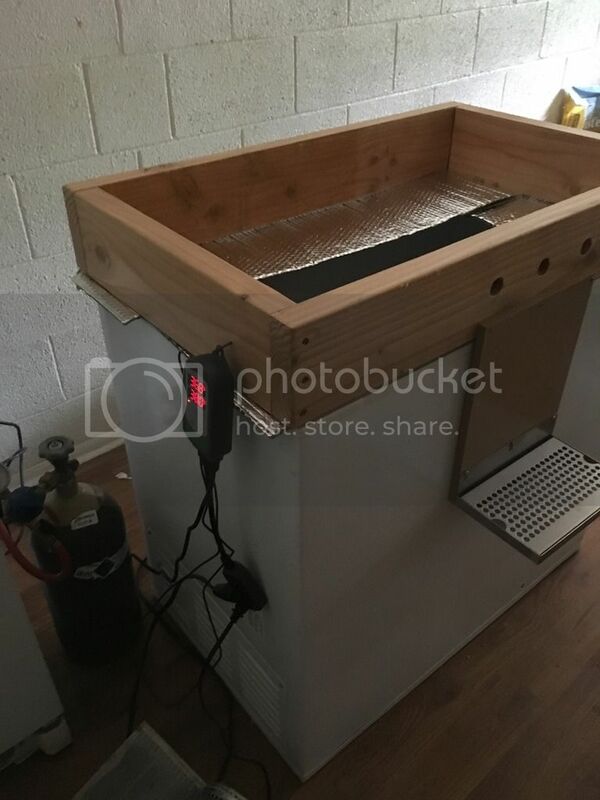 Maybe a quarter inch board with a piece of metal that would create a easily cleanable back splash area? Just mount it to the front of the collar with like 3 screws, it’s not like there is going to be any weight on the thing. Anyways. I’m gonna have to think about it. Yeah, that sounds like the right kind of idea. The only weight to support will be a pint of beer at most, and a metal backsplash would look pretty slick. 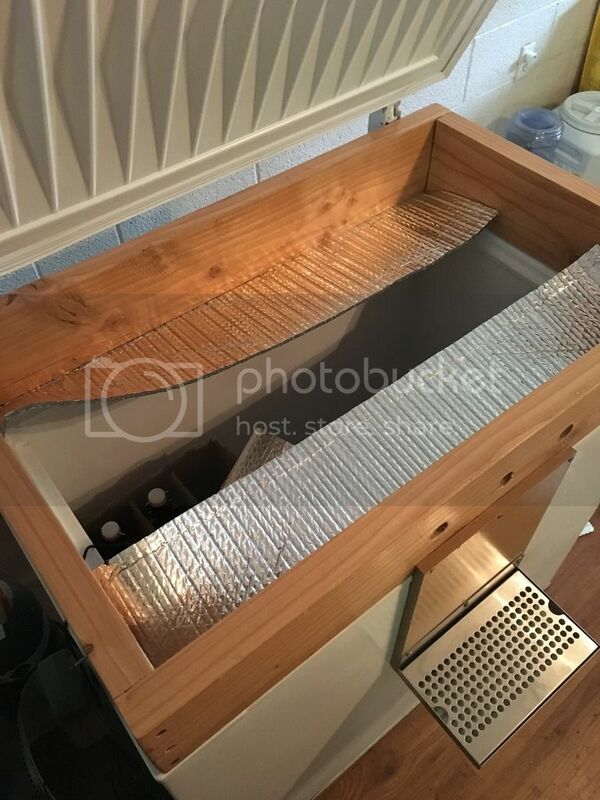 I got the piece of wood (11x10) and was advised to just seal it with a polycrylic from the hardware store (several coats) I was looking at metal for the backsplash but unless it’s stainless I was told it would eventually corrode (if it was aluminum or galvanized steal.) I’ll have to see how it works out. Been a fun project so far. Almost finished! 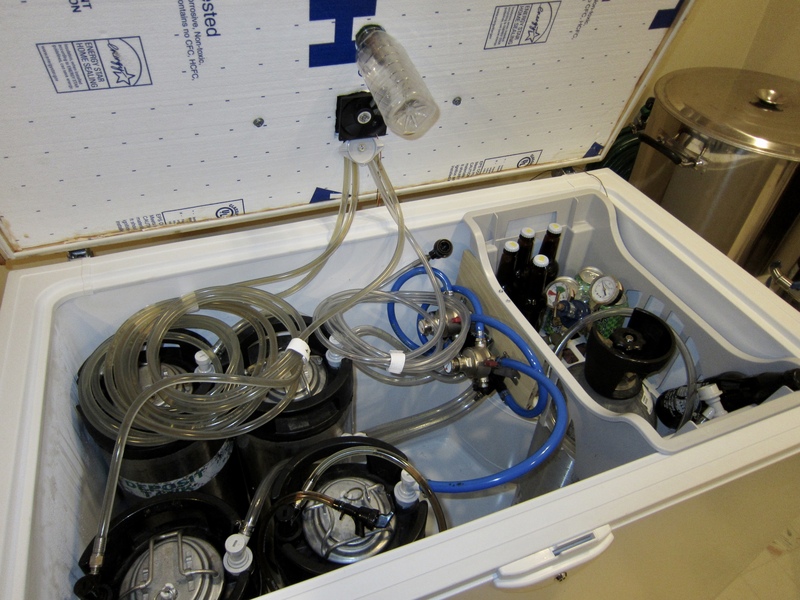 Secure insulation, put taps in, secure manifold, drink beer. Oh and Robert, that damp rid.... I got some of that and it was in there while I was fermenting with a blow off valve. That damp rid took the moisture out of the half gallon jug, I’m surprised the beer didn’t get compromised while fermenting... live and learn. waiddaminnit....I use damp rid in my freezer with a half gal. blowoff jar. Hasn't ever affected the liquid level. But we live in wet places, Denny. The air up there might make a difference? I don’t know. I’m at 7k feet elevation and it’s 84% humidity, our monsoon season. It was pretty strange when I checked. I’ve had air locks dry up too semi frequently as well. Maybe it was a mixture of heat, coolness, humidity. I’m not sure. All done. Thank you for all of your help, feedback, and suggestions. I haven’t poured anything yet. But did cut that co2 line back, will probably cut the shorter lines back. And. I hope 8’ of beverage line is enough. I’ll find out after work. Nice job! However, I have one question and I apologize for seeing this too late to post earlier during the construction phase. 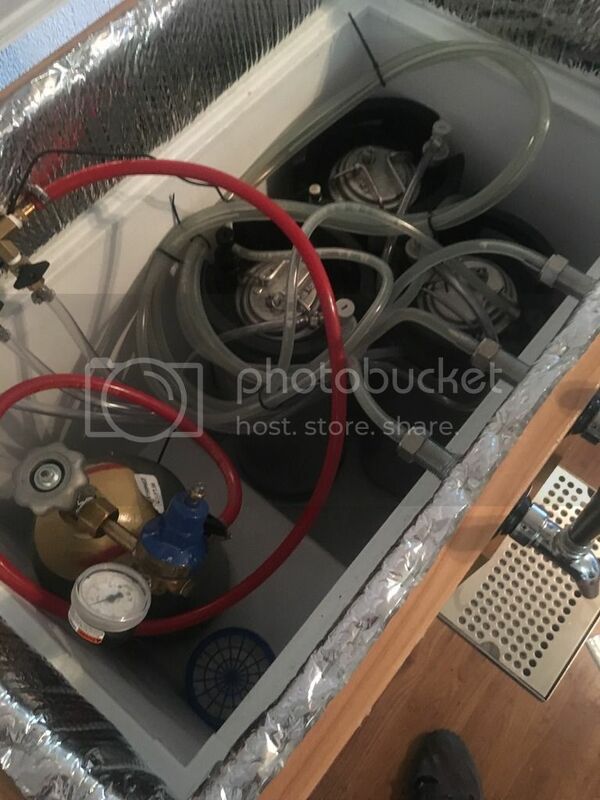 How do you keep the collar in place on the top of the keezer, did you glue it down? 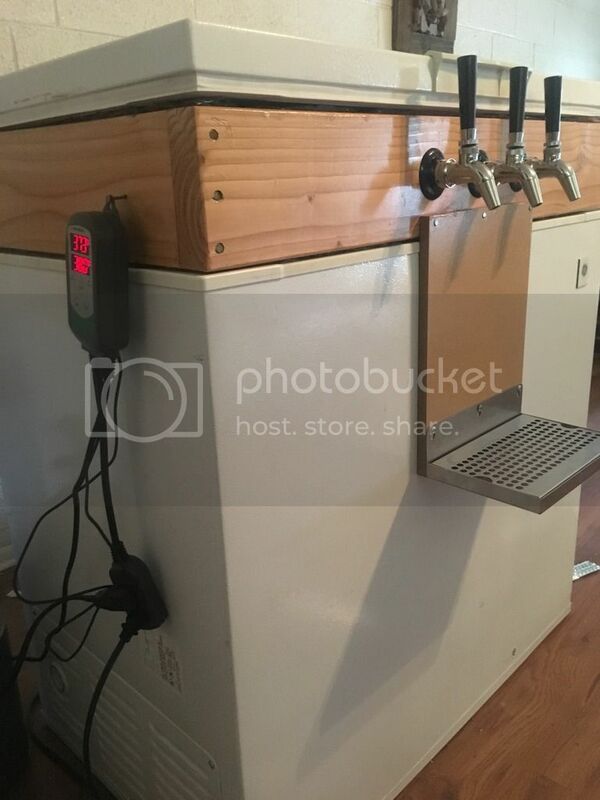 I built something similar and used some Luan sub flooring as a facing on the front of the collar that fits over the top edge of the keezer. This keeps the collar from moving around and provides a nice smooth facing without any gluing. I can just pop it off when needed. If you have problems with the collar moving around, you might be able to add some to the inside of the collar.